After a good night’s sleep, I critically looked at that last drawing as of my previous writing. 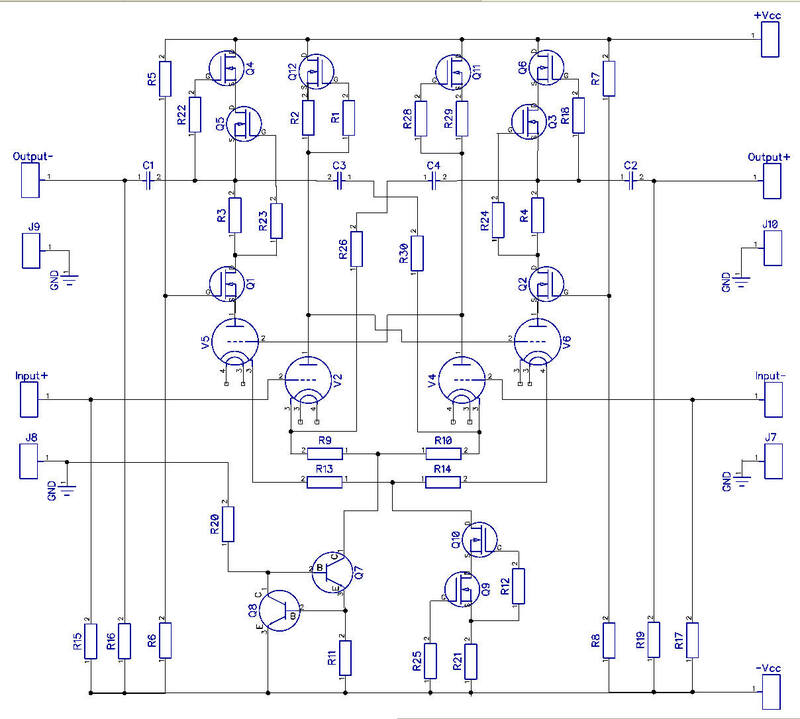 Gee, what a complicated mess, … especially with those 4 extra resistors constituting the double step voltage divider for the negative feedback “into” the grids of the input tubes. When I look at this “afresh” in this early morning hour, I come to the conclusion that it is down right ugly, this concept of negative feedback fed into the grids. The previous method, of applying the feedback into the cathodes of those input tubes is a much more elegant scenario. If only I could find a way to resolve the “one additional inversion” challenge … resulting in an effect that the anodes of the V5, V6 behave exactly as the anodes of V2, V4, without the “inversion” of the phase … Simply make them ‘disappear’ – phase-wise, at least. …. I got it. A new idea. Let’s do exactly just that. Let’s make V5 and V6 “phase-wise disappear”. b). 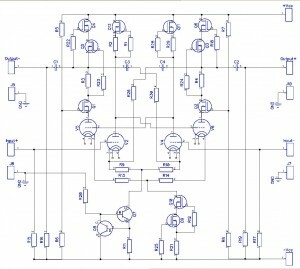 The setup allows to get rid of those double-step feedback voltage dividers, diminishing the count of resistors by 4.
c). This additional direct cross coupling of the left and right branches, together with the cathode resistors of V2 and V4, gives a stronghold so as to think about a better “self-balancing” act, especially in DC terms, and specifically pertaining to the anodes of V2 and V4. Please look at the R13 and R14 resistors in the cathodes of V5, V6. They have a similar function as the R9 and R10 in the cathodes of V2, V4. As the current sinks imply a constant current, the resistors constitute a “see-saw” effect, and working together as a degeneration cathode feedback for it’s respective tube, they tend to level out and balance the left and right side of the see-saw. As the voltages on the grids of V2 and V4 are similar (ground potential), the self balancing see-saw effect pertaining to currents flowing through V2 and V4 should work well. But this COULD imply that the anodes of V2 and V4 may position themselves at totally different voltages. ESPECIALLY, that they are current sourced from the DN2540 Current Sources. So there MIGHT be a potential problem with the DC voltages on the anodes of V2 and V4. Such uneven voltages would obviously “carry on” to the grids of V5 and V6. 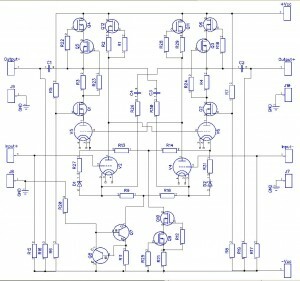 But if at all possible, we would like do get rid of any such imbalance, as we want this circuit to be perfectly balanced. Both AC-wise, but also DC-wise. Now, … have a close look at the cathodes of V2 and V4. What is it exactly that we are negatively feeding back to these cathodes ? It is an AC component, originating from capacitors C3 and C4 and fed back to the cathodes via voltage dividers R26-R9 and R30-R10. 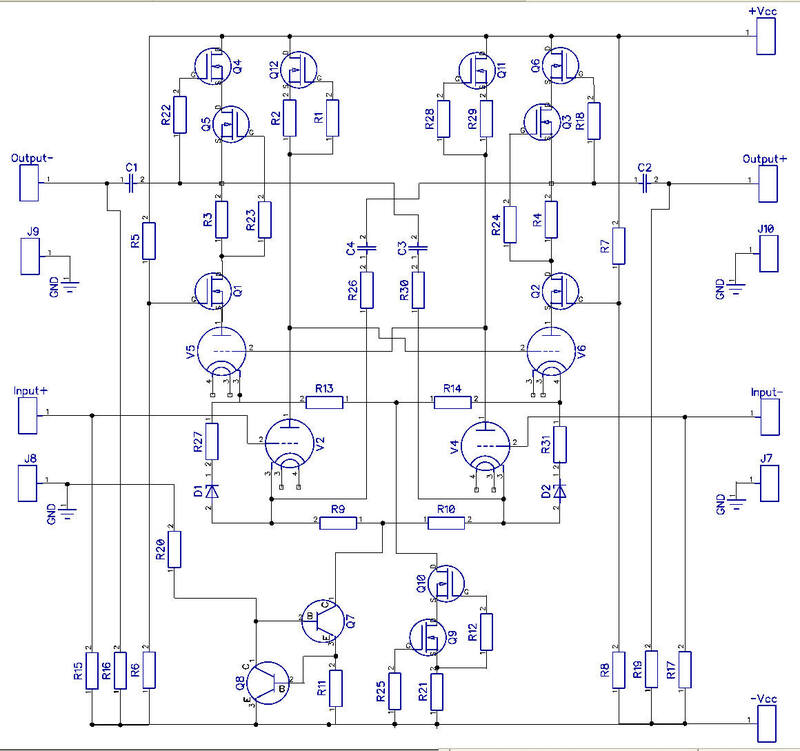 So, in other words, it takes care of ‘balancing’ the AC world within this differential circuit. 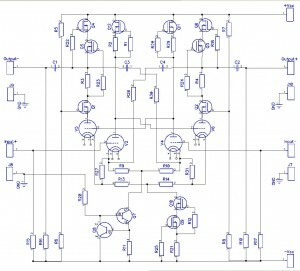 Now, … who says that we cannot do the same thing with the DC world of this circuit ? Let’s just suppose that there is a DC voltage imbalance between the anodes of V2 and V4. Such an imbalance would obviously be reflected upon the cathode resistors of R13 and R14 of the following directly coupled tubes V5 and V6. But R13 and R14 also constitute a see-saw, sitting on a current source. Now – imagine, that we tap into these voltages on the cathodes of V5 and V6, and feed these DC voltages, via a very high resistor, say 1 megaohm for starters, to the cathodes of V2 and V4. The only thing I am still pondering about is the DC offset between the pair of R13-R14 and the R9-R10. Since we would like to correct the differences in anode voltages, the DC offset only muddles the waters … So what if we add in series to each of the resistors R27 and R31 a pair of identical, additional zener diodes, say with a Zener voltage of 99V (33+33+33), so as to get rid of the common DC offset and concentrate on the differences ? Need to think it over. Not sure yet. The common DC offset would be eliminated, and hence we would have more freedom in fine-tuning the values of the resistors R27 and R31, so as to get exactly the amount of “differential impact” upon the DC anode voltages of V2 and V4 and the amount of ‘leveling’ that we need, but at the same time, not to disturb the see-saws and current sources too much. With the zener diodes added. The above picture is exactly as before, with the only difference being the two added zener diodes, so as to get rid of the common DC offset between different levels of tubes. Apart of that, some components have been graphically rearranged, shifted a bit, so as to better visualize the DC offset relationships. It turns out that the cathodes of the input tubes V2, V4 are now being ‘fed’ with two independent feedback components: The AC feedback component, tapped from the other branches output, but at the same time, a DC feedback component, resembling the DC voltage relative imbalance of the other branches input triodes anode. I presume that we would first need to sort out the level of DC feedback, so as to control the anode voltage imbalance / variation within a reasonable value, and after that, determine the required level of AC feedback, which in essence will determine the gain of the whole stage. OK. I think that this setup is now more or less complete, with a good chance of being a good performer. Please kindly send me your comments and suggestions regarding this proposed topology. The main question is as follows: is it safe to assume that this whole design shall remain unconditionally stable ? Please consider a huge amount of gain, due to the CCS loading of V2+V4, followed by V5+V6. 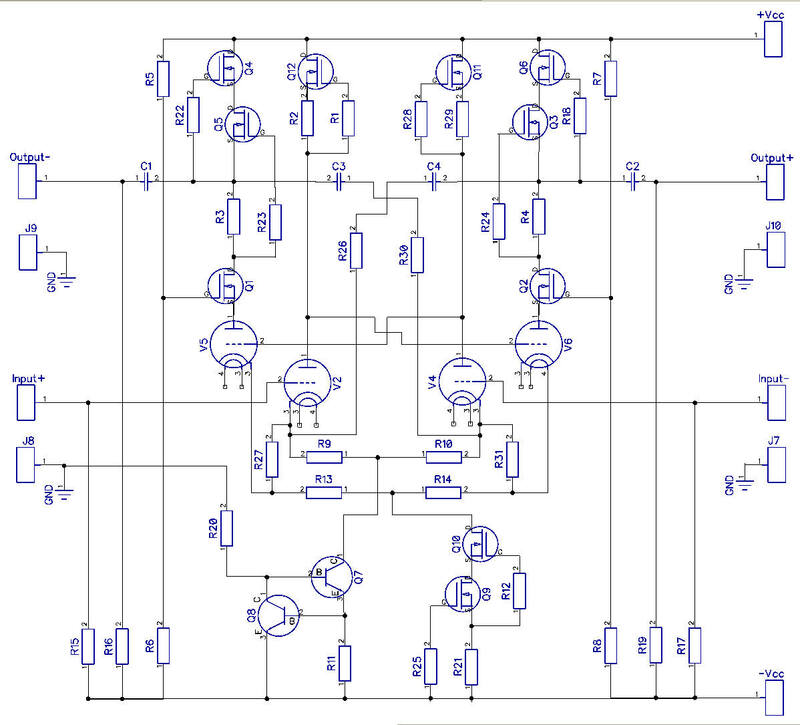 What I am getting at is this: if this stage is exposed to a gain of several thousand (like a mu = 100 x 100 = ~ 10 000), a gain that may then be lightly tempered by the NEGATIVE cross feedback as defined by C3, C4, and the voltage dividers: R26 – R9 and R30 – R10, will such an AC feedback suffice to guarantee unconditional stability ? Awaiting your feedback (via e-mail or facebook).